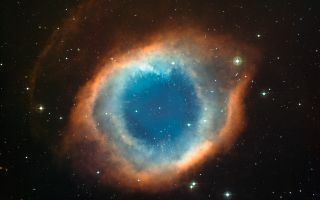 This colour-composite image of the Helix Nebula (NGC 7293) was created from images obtained using the the Wide Field Imager (WFI), an astronomical camera attached to the 2.2-metre Max-Planck Society/ESO telescope at the La Silla observatory in Chile. In this space wallpaper, this colour-composite image of the Helix Nebula (NGC 7293) was created from images obtained using the the Wide Field Imager (WFI), an astronomical camera attached to the 2.2-metre Max-Planck Society/ESO telescope at the La Silla observatory in Chile. The blue-green glow in the centre of the Helix comes from oxygen atoms shining under effects of the intense ultraviolet radiation of the 120 000 degree Celsius central star and the hot gas.